The Rock Creek Valley, once home to Native Americans, had attracted European settlers by 1703. Before he became president in 1825, John Quincy Adams purchased Adams Mills on Rock Creek from his cousin. The mills, just down the hill, processed flour and plaster. While other millers here relied on slave labor, the anti-slavery Adams refused to do so. The park to your left was once part of a pair of cemeteries established back when this hilltop lay beyond the city limits. After the Smithsonian began building the National Zoo in 1889, the cemetery associations moved remains nearest the zoo to other locations, including Woodlawn Cemetery in Southeast Washington. and free day care to more than 500 African-American children. Its last location was 1811 Ontario Place, to your right. During winter you can see a mansion on the Zoo grounds. It is Holt House, named for a physician, Dr. Henry Holt, who farmed the area. During the Civil War, Cliffburne Barracks and Hospital occupied this area. 1909 map shows where the Society of Friends and Union Benevolent Association cemeteries once were located. Planting a garden in Community Park West, 1978. Henry Holt, son of Dr. Henry Holt and last private owner of Holt House, sits in front of the house, 1899. Walter Pierce, above, and Charlotte Filmore, two leaders in efforts to create a park. 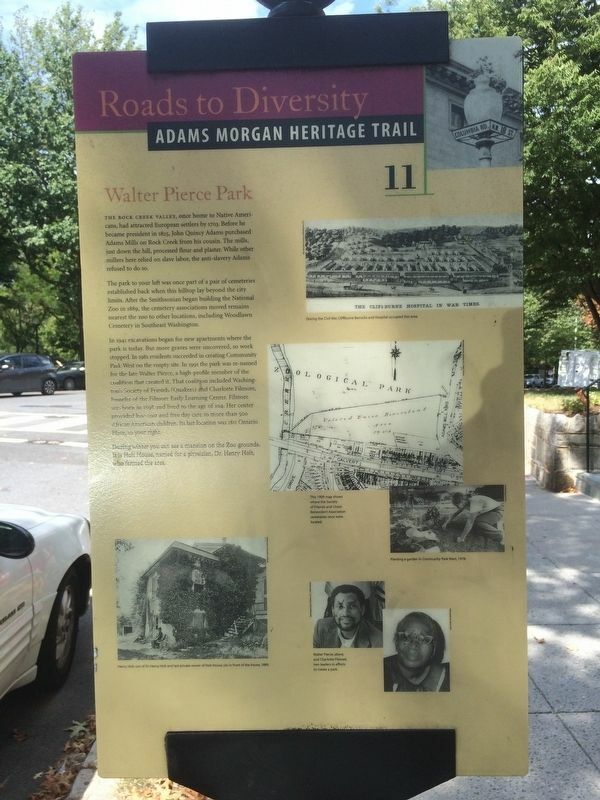 The Adams Morgan story begins with its breezy hilltop location, prized by Native Americans, colonial settlers, freedom seekers, powerful Washingtonians, working people, and immigrants alike. Unlike most close-in neighborhoods, Adams Morgan has never been dominated by any of these groups. Today’s rich diversity is the legacy of each group that has passed through. The park is in the background in this view. to the name Adams Morgan, and you’ll meet presidents and paupers, natives and immigrants, artists, activists and authors. 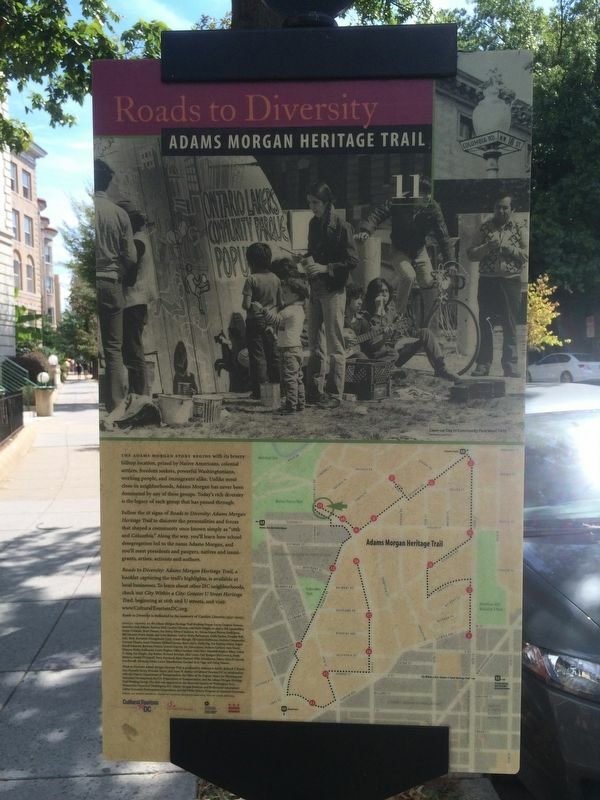 Roads to Diversity: Adams Morgan Heritage Trail, a booklet capturing the trail’s highlights, is available at local businesses. 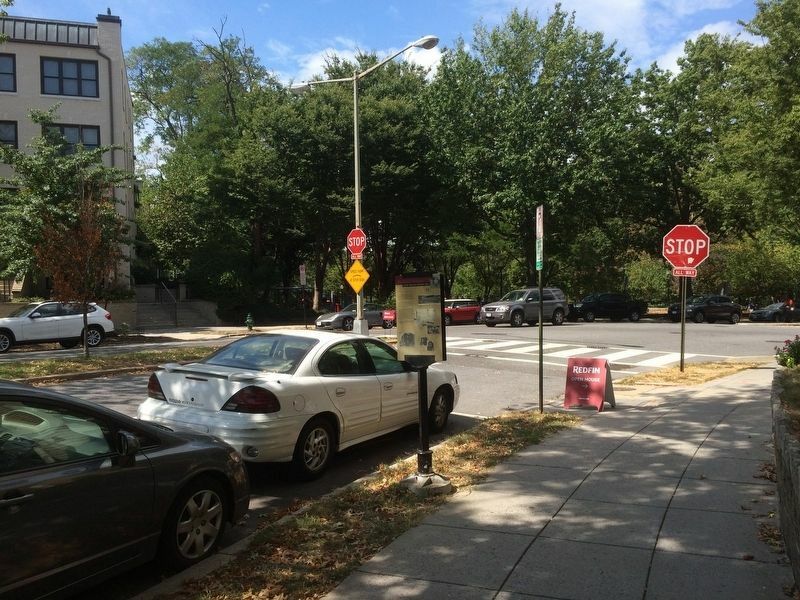 To learn about other DC neighborhoods, check out City Within a City: Greater U Street Heritage Trail, beginning at 16th and U Streets, and visit: www.CulturalTourismDC.org. Roads to Diversity is dedicated to the memory of Carolyn Llorente (1937-2003). Contributors and sponsors of the Adams Morgan Heritage Trail. Location. 38° 55.435′ N, 77° 2.668′ W. Marker is in Adams Morgan, District of Columbia, in Washington. Marker can be reached from Adams Mill Road, NW, on the right. Touch for map. 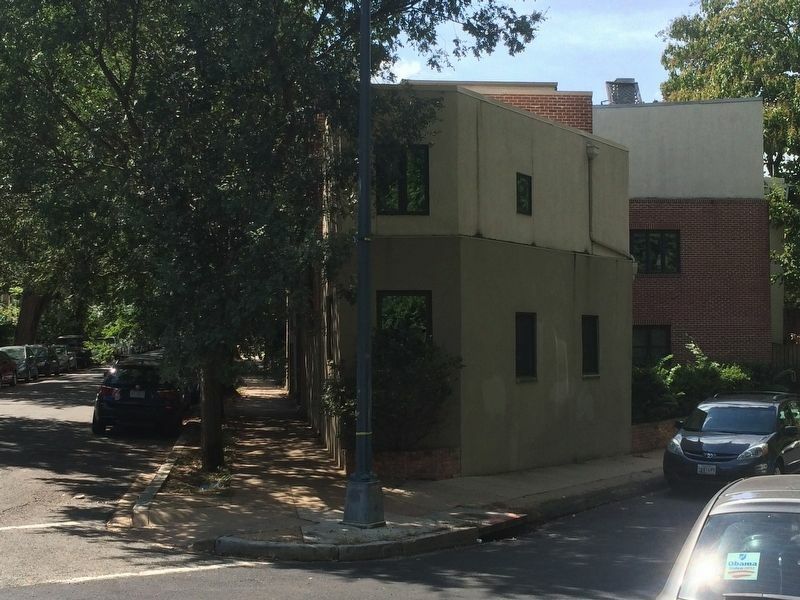 Marker is at or near this postal address: 2633 Adams Mill Road, NW, Washington DC 20009, United States of America. Touch for directions. 4. 1811 Ontario Place, NW, last location of the Filmore Early Learning Center. The building is triangular-shaped, at the corner of Ontario Place and Ontario Road, NW. (about 500 feet away); Tragedy at 18th and Columbia (about 600 feet away); Serving the Neighborhood (about 800 feet away); Archaeology in Adams Morgan (approx. 0.2 miles away); Soldiers and Sailors Buried at Mt. Pleasant Plains Cemetery, 1870-1890 (approx. 0.2 miles away); Kalorama Triangle (approx. 0.2 miles away); The ›Duke‹ Ellington Memorial Bridge (approx. 0.2 miles away). Touch for a list and map of all markers in Adams Morgan. More. Search the internet for Walter Pierce Park. Credits. This page was last revised on March 12, 2019. This page originally submitted on November 5, 2016, by J. Makali Bruton of Querétaro, Mexico. This page has been viewed 254 times since then and 11 times this year. Last updated on March 7, 2019, by Devry Becker Jones of Washington, District of Columbia. Photos: 1, 2, 3, 4. submitted on November 5, 2016, by J. Makali Bruton of Querétaro, Mexico.